The vineyard land, structures and grapes are Certified Organic. There are no pressure treated posts or chemical weed killers/glyphosates applied to the land. Our photo shows the full understory intact in our vineyard. 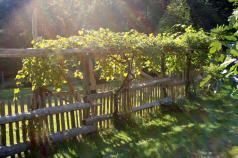 The vineyard sits on a terraced gravelly, sunny south and south-east facing slope. Pre-orders for harvest 2015 are welcome. Farm Stays and Accommodation Available!